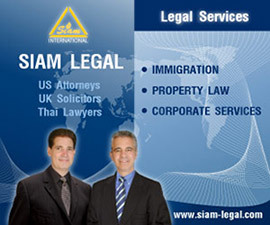 Www.thaiembassy.com is a website maintained and supported by Siam Legal, a Thai law firm. Www.thaiembassy.com is not the official site of the Royal Thai Embassy and is not affiliated with the government of Thailand. Before using the website, please read this disclaimer. Service is the https://www.thaiembassy.com website operated by Siam Legal (Thailand) Co., Ltd. The non-personally identifiable information, on the other hand, shall be used to manage the website. It may be used to analyze data for easy navigation and access on the website. Should you not want us to use your personal identification, do not submit any information to the website or to any of our lawyers. We may use and store information about your location if you give us permission to do so (“Location Data”). We use this data to provide features of our Service, to improve and customize our Service and to know where to concentrate our marketing efforts. You can enable or disable location services when you use our Service at any time, through your device settings. Siam Legal (Thailand) Co., Ltd. will also retain Usage Data for internal analysis purposes. Usage Data is generally retained for a shorter period of time, except when this data is used to strengthen the security or to improve the functionality of our Service, or we are legally obligated to retain this data for longer time periods. Under certain circumstances, Siam Legal (Thailand) Co., Ltd. may be required to disclose your Personal Data if required to do so by law or in response to valid requests by public authorities (e.g. a court or a government agency). To protect and defend the rights or property of Siam Legal (Thailand) Co., Ltd. If you are a resident of the European Economic Area (EEA), you have certain data protection rights. Siam Legal (Thailand) Co., Ltd. aims to take reasonable steps to allow you to correct, amend, delete, or limit the use of your Personal Data. The right to withdraw consent. You also have the right to withdraw your consent at any time where Siam Legal (Thailand) Co., Ltd. relied on your consent to process your personal information. In case of revision and information is required, a notice may be sent informing you of the reason for the change, of the need for the information we sought from you, and the choices granted to you regarding its use.